Istanbul: A mute Syrian boy, using just body movements, gives a harrowing description of life under Daesh in Syria. A crowd of passionate anti-establishment protesters gathers. And a galaxy of white ceramic CCTV cameras keeps a Big Brother-like watch over a city. These are just some of the images from this season’s contemporary exhibitions in Istanbul as artists grapple with issues of political turbulence in Turkey and raging violence across the border in Syria. And while critics of President Recep Tayyip Erdogan say the government is riding roughshod over freedom of expression, many artists are openly defying the trend by tackling big issues head-on in a still punchy scene. Almost immediately after the failed coup against Erdogan last year, Turkish authorities launched widespread purges which opponents say have gone beyond suspected coup plotters and are affecting intellectual and artistic circles. Some artists have self-censored or even left the country. But others have sought to develop new ways of addressing the situation. “The artistic scene in Istanbul is not in the process of shrinking — it is in the process of becoming more interesting,” said artist Safak Catalbas. “The difficult circumstances make us more creative,” she added. This year’s Istanbul Biennial, the most important contemporary art event in Turkey, did not shy away from controversial topics like the refugee crisis or conflicts in Syria and Iraq. The event, which was curated by Scandinavian duo Michael Elmgreen and Ingar Dragset and closed its doors on November 12, also contained more than just coded references to the current situation in Turkey. Turkish artist Erkan Ozgen, a Kurd, presented the video installation of the Syrian mute boy, Mohammed, in a short video entitled “Wonderland”. A spectacular wall mural by French-Moroccan designer Latifa Echakhch showed the crowd of protesters in a reference to anti-government rallies in Turkey crushed in 2013. Another example came from Turkish artist Burcak Bingol, who used ceramic CCTV cameras scattered across the city to recall the inquisitive eyes of the authorities in a country which has been living under a state of emergency for more than a year. “All exhibitions must, in one way or another, address the local political-social context to be relevant,” said Biennial director Bige Orer. Few dispute that the climate in Istanbul has changed greatly since 2005, when in the early days of Erdogan’s rule Newsweek magazine famously dubbed the Turkish metropolis “the coolest city in the world”. The repression of the spring protest movement in 2013 — which many artists were involved in — marked the end of a certain carefree attitude in the country. At least eight people were killed and more than 8,000 injured by police during anti-government protests against plans to build on land occupied by Gezi Park in central Istanbul, according to Turkish NGOs. Asli Sumer, who runs a gallery in the waterside district of Karakoy, said, however, that instead of criticising the authorities directly, artists are interested in ways of overcoming these hardships. “An artist with whom I work is especially interested in plants and their capacity to grow back by being more resistant,” she said. 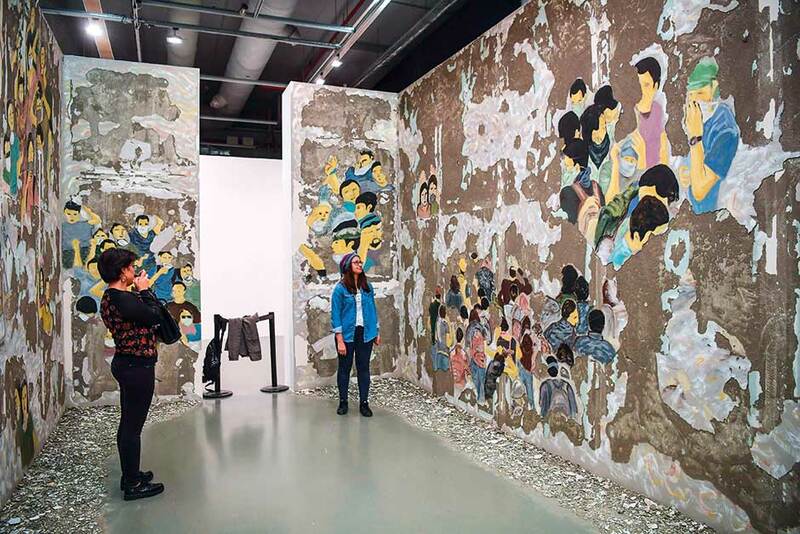 In addition to the biennial, the international contemporary art fair in Istanbul welcomed more than 80,000 visitors between September 14 and 17, a turnout that also showed the resilience of the Turkish arts scene. This year, one of the main exhibits on display was the “Box of Democracy” by Bedri Baykam, one of the seminal modern works of Turkish three-dimensional art. The exhibit — a kind of large telephone box inside which the viewer is able to enjoy a totally free space — was created in 1987 to criticise the years of repression inherited from the 1980 military coup. Maintaining such creative freedom is made possible through the financing of contemporary art by private funds without fear of state meddling. The Istanbul Biennial is organised by the privately-run Istanbul Foundation For Culture and Arts (IKSV) and funded primarily by family-run industrial conglomerate Koc Holding. “As a result, the state has little leverage to use pressure,” said Orhan Esen, an expert on urban history and Istanbul’s art scene. In addition to the political situation, several recent acts of vandalism have shaken the art scene. A statue of a naked man by Australian artist Ron Mueck was damaged on the Asian side of Istanbul in late October. Last year, several assaults in the Tophane district on the European side of Istanbul, an area long inhabited by an uneasy mix of expats, Istanbul hipsters and conservative Turks, forced galleries to move to Kadikoy, a district on the Asian side. “The other day, my artist friends told me ‘from now on, we will not show some of our exhibits in Turkey’”, lamented artist Ozgen. He added that other artists had already left the country. The situation in Turkey for artists is “absurd”, he admitted. But the situation has not dented his optimism and Ozgen recently opened a new contemporary art gallery in the southeastern province of Diyarbakir, despite ongoing violence in the region as the military battles Kurdish fighters.